We Are Moving to a New Site. Please Follow Us. This month we celebrate our one year anniversary. It has been a good inaugural year: we have published 60 blogs, had almost 50,000 views and our CBE post even got noticed by Diane Ravitch! We are celebrating by moving to a new website where we can have a few more bells and whistles and fewer scary clowns (yes, we had a few complaints). Our goal remains the same, to call out the “baloney” in Florida’s Accountability System… and believe us, there is an overwhelming amount of baloney there. Please follow us on our new page: accountabaloney.com, spread the word and don’t forget; if you smell accountabaloney, say something! Let that sink in… The Commissioner of Education believes BOOKS may be the source of harm or ruin in today’s education system. Stewart stood in front of a packed auditorium at Lecanto High School on Tuesday morning to share her thoughts on what she sees at the inevitable digital takeover of education. The best way to teach to the standards, she said, is with digital content. How are text books ruining education? What is her evidence to back up the claim that digital content is best? What about the impact of a quality teacher? What will our schools be like if she gets her wish and textbooks are eliminated? Please, let’s not burn the textbooks just yet. There is a significant amount research that should make Florida question whether the “inevitable digital takeover” is a good thing. This fascinating Scientific American article looks at the science of reading on paper vs screens and suggests that “reading on paper still boasts unique advantages.” Among other things, it suggests that reading on a computer screen may impair comprehension. A study from Israel, showed learners prefer studying text from printed hardcopy rather than computer screens and, when reading on paper, had a better sense of their own understanding. When reading from computer screens, students thought they had absorbed the information but tests showed otherwise. A Missouri study showed that college students, when given the choice, overwhelmingly prefer paper textbooks. A study out of Dartmouth found that reading on digital devices seems to reduce abstract thinking. “Reading on computer screens and smartphones has made people unable to fully understand what they are reading as our brains retreat into focusing on small details rather than meanings”, the study claimed (read more here). The digital classroom emphasizes typing over handwriting. Read here and here to learn about concerns regarding brain development and handwriting. This Scientific American article discusses how students who wrote their notes by hand remembered more and had a deeper understanding of material than those who typed notes on their laptop. In Rhode Island, Illinois and Maryland, PARCC scores were shown to be higher when students took the test on paper rather than computer, suggesting taking these tests on the computer puts students at a disadvantage. Read here about growing concerns regarding the health impacts of WiFi (Radio Frequency (RF) exposure) on young children. Read here to learn how digital devices may be affecting children’s eyes, leading to a rising incidence of nearsightedness, which increases the risk of later glaucoma or retinal detachment. Read here to learn how scientists have urged Google to “Stop Untested Microwave Radiation of Children’s Eyes and Brains” associated with Google Cardboard devices in schools. When the textbooks are eliminated, it will be very difficult for parents to review the scope, content and quality of their children’s curriculum. Perhaps that is by design. How Good is Personalized Learning Content? While the responsiveness of personalized learning systems hold promise for timely feedback, scaffolding, and deliberate practice, the quality of many systems are low. Most product websites describe the input of teachers or learning scientists into development as minimal and after the fact (Guernsey & Levine, 2015). Products are not field tested before adoption in schools and offer limited to no research on the efficacy of personalized learning systems beyond testimonials and anecdotes. In 2010, Houghton Mifflin Harcourt commissioned independent randomized studies of its Algebra 1 program: Harcourt Fuse. The headline findings reported significant gains for a school in Riverside, California. The publicity did not mention that Riverside was one of four schools studied, the other three showed no impact, and in Riverside, teachers who frequently used technologies were selected for the study, rather than being randomly assigned (Toby, et al., 2012). In short, very little is known about the quality of these systems or their generalizability. Why are we spending hundreds of millions on programs without documented research confirming their efficacy? At freedictionary.com, the word “bane” has a secondary definition: “A source of persistent annoyance or exasperation.” Perhaps this is what Commissioner Stewart meant when she called textbooks the bane of education. All the documented evidence showing “old-fashioned” text books to be more effective, less harmful and more favorable must be exasperating to a woman whose vision is to completely digitalize Florida’s classrooms. There is overwhelming evidence demonstrating that, currently, tech-ed is NOT superior to traditional education and the digital classroom may have significant consequences to a child’s health and well-being. These problems won’t go away if we eliminate textbooks. Billions of dollars are being funneled into technology with, as Bill Gates admitted, little positive academic results. Ed-tech companies, and their investors, are becoming rich. Is this an appropriate use of our limited education budgets? Parents and taxpayers should be outraged. This wonderful article by Dr. Karen Effrem, explains that, rather than corporate education technology and “Big Data” driven education, parents want “proven methods of education — teaching by human beings, plus focus on handwriting, classic literature, standard algorithms, and actual content knowledge — instead of skills-training and constant invasive psychological manipulation and assessment.” Such schools, where human interaction is valued over technology, exist (read about them here and here) and could be models for creating the education programming parents want for their children in Florida. What is the “bane” of Florida’s education system? Is it our textbooks? I don’t think so. The bane of our education system is the rush to the digital classroom, where profits and privatization matter more than providing a quality education for all our children. Please don’t burn the books. Florida prides itself in the number of Advanced Placement courses its high school students take. Is it too much of a good thing? Are decisions being made in the best interest of each student? If you live in Floriduh, you will not be surprised to learn that when you follow the money, you find a bunch of accountabaloney. In February 2016, the Florida Department of Education celebrated Florida’s position as second in the nation for the percentage of 2015 Florida high school graduates taking an Advanced Placement (AP) exam while in high school and third place for the percentage of 2015 high school graduates potentially earning college credit by scoring a 3 or higher on an AP exam. Over the last decade, the number of Florida graduates participating in AP more than doubled, increasing from 40,276 students in 2005 to 86,400 students in 2015, an increase of 115 percent. Florida ranks third in the nation for the percentage of 2015 graduates who potentially earned college credit by scoring a 3 or higher on AP exams (30.7 percent, higher than the national average of 22.4%). Over time, increasing numbers of Hispanic, African American and low income students are taking and passing Advanced Placement courses/tests. The increasing numbers of successful Advanced Placement participants is certainly the result of an accountability system that rewards participation in Advanced Placement Courses. Beginning in 2010, Florida adjusted it’s school grade formula to reward (first) participation and (now) performance on Advanced Placement assessments. Currently, up to 10% of a High School’s grade is based on the percentage of graduates who earned a score on an acceleration examination (a level 3 or higher on an Advanced Placement exam), a “C” or better in a dual enrollment course, or earned an industry certification. For the purpose of calculating this rate, a student is counted no more than once in the numerator and denominator. Students who pass more than one AP course (or dual enrollment course or industry certification) do not earn any extra points in the school grade calculation. The College Board, who created and administers Advanced Placement exams, has frequently reported that students who are successful in AP exams are more likely to graduate college. From Florida’s current school grades report, it appears that the current system has been successful in providing at least some accelerated courses (either AP, IB, AICE, dual enrollment or industry certification) for all of Florida’s high school students. If passing one AP exam is good, is passing more exams better? Anyone with a child in Florida’s high schools today knows that students are being pressured to take increasing numbers of AP courses, resulting in some students taking as many as 10, 15 or more AP courses during their high school career. How many is too many? “I have interviewed scores of college admissions officers and read the briefing materials of hundreds of colleges. Not one has ever said that adding an Advanced Placement class can make or break one’s chances of getting in. Selective colleges want to see applicants take the most challenging courses at their high schools. In most cases, particularly in the Washington region, that means AP, International Baccalaureate or the Advanced International Certificate of Education. Selective colleges also like to see three to five AP courses, with good scores on the tests to show that the student is ready for college work. That can be accomplished by taking one AP course sophomore year, one or two in the junior year and one or two in the senior year — not an overwhelming burden for any student with a shot at a selective college. “What are we doing to our kids when we put them through this system that doesn’t allow them get enough sleep and causes them to be ramped up and stressed out?” -Jay Chugh, Teacher, Lafayette, CA. Since the advent of No Child Left Behind, parents have become increasingly concerned with the loss of creative, authentic experiences in the classroom, pushed out by increasing levels of test preparation for high stakes standardized testing. Rather than developing “the whole child” with art, music and other creative programing, students are spending more and more time focused on and preparing for tests. In such an environment, should Advanced Placement courses be considered just more “teaching to the test”? Is that what our students need? At the end of the “Advanced Pressure” documentary, high school teacher, Jay Chugh, suggests a solution: “The best thing to do would be to get rid of the AP program and just design a course that prepares students for the college experience.” Ahhh, such a system used to exist, and in some instances still does, and it was called “honors courses.” Of course, in Florida, students who pass honors courses do NOT count in the “College and Career Acceleration” category of the School Grading system. Also, if students abandoned AP courses for equal rigorous honors courses, the FLDOE might no longer have national bragging rights. Perhaps the biggest obstacle to returning to more honors classes in Florida’s public high schools, would be the lost incentive funding paid to the schools and teachers. Last year, Monroe County increased the financial incentives for AP participation in their schools when it joined in partnership with the National Math and Science Initiative, another profit generating (net profit of $7 million in 2014) non-profit, which has the goal of increasing successful participation in specific STEM (Science, Technology, Engineering, Math) and AP Literature courses. Despite concerns that the “STEM crisis” might be a myth, Monroe County School District entered into a 3 year, almost $2 million, contract with NMSI, who lists the College Board as a partner and “funder.” Everytime NMSI is successful in increasing participation in AP courses, its partner, College Board, increases revenue. 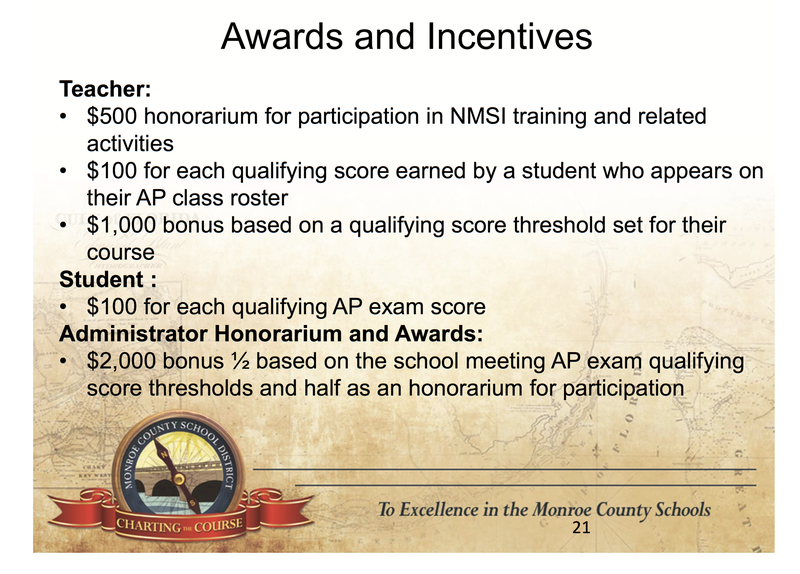 In addition to providing aggressive (much needed Monroe County) professional development programs for AP instructors, the NMSI program rewards students, teachers and administrators for successful AP test scores. Such funds are in addition to the previously described FS 1011.62(n) bonus funding. Given these financial incentives, it is difficult to imagine that schools might scale back on AP courses in pursuit of a more balanced education experience for students. When administrators receive bonuses based on AP scores, will they work to increase dual enrollment or honors participation? Not likely. Monroe County AP teachers could earn more than $6,500 annually if 30 of their AP students score a 3 or higher. Would these teachers be willing to give that up to teach an honors class? Florida’s test based accountability system is designed to encourage participation in Advanced Placement and other acceleration programs. A 2009 OPPAGA Report (Report No. 09-12) showed the incentive funding for AP courses exceeded the required program costs by more than $30 million annually. With increasing AP enrollment and, therefore, increasing costs, the OPPAGA study recommended reducing the level of incentive funding, but little legislative action was taken. The incentive programs and school grades system are to be designed to encourage (push) more and more students into AP courses, without regard to any potentially negative impact on the students’ unique education needs. The College Board, with profits of $62 MILLION annually. The FLDOE, with national bragging rights regarding AP participation AND the ability to deflect attention from declining SAT and ACT scores. Districts, high schools and teachers, who receive bonus funding. National Math Science Initiative, ready to expand across the state. The losers? Overstressed high school students, curiosity and innovation and those who value an authentic education experience. Expensive programming that benefits everyone’s bottom line, while underserving the educational needs of the students, is more evidence of Florida’s failed accountability system. It is time to reign in the overemphasis of Advanced Placement coursework in our classrooms. Schools should be offering students the courses that best fit their individual interests and needs and not the courses that provide the biggest bonuses. Was HB7069 Just Another VAM Scam?